Feral (wild) hogs are devastating farm crops from North Carolina to California and most points south of that line. It won't be long before they're causing similar issues in the upper midwest as well. That's pretty irrefutable. A relatively small sounder can wreak havoc on a freshly planted corn field. They'll mow down a barley field, and whatever they don't eat they'll trample into the mud. They can till up a crop of peanuts or sweet potatoes to the point where it's barely cost effective to replant. There are a few methods to manage these animals. Poison is one consideration, but most poisons are indiscriminate. They tend to kill animals that you didn't really intend to kill, from coyotes and racoons to cats and dogs. For this reason, their use is regulated and even prohibited in some locations. Recent research into sodium nitrate (the food preservative) has shown promise, but at this point it is still in the research phase. Trapping is an efficient option. By capturing the animals alive, the trapper is able to ensure that non-target animals are not harmed. A properly operated trapping system, such as the M.I.N.E. (Manually Initiated Nuisance Elimination) program recommended by the guys at Jager-Pro can be particularly effective in removing entire sounders. This is, arguably, one of the best options currently available, but it requires time and patience. It is also very localized. Large-scale trapping would require significant outlay for equipment, and a lot of time to manage multiple traps across a wide geographic area. On the small scale, this method has a certain level of success. Serious hunting pressure will drive hogs out of an area. However, the problem here is that the hogs will re-settle on another property. They'll also come back eventually, once the pressure has eased. For the farmer who just needs time for his crops to take root, or time to ripen and harvest, that may be enough. But in big farm country, like Georgia, it's not good enough to push the hogs onto your neighbor's farm. It's not real neighborly either. To address this, small companies have cropped up and have been offering their services to multiple farmers in an area. This way, the depredation hunters can move with the hogs and keep the pressure up until their numbers have been reduced to a manageable level. It's pretty much a given that the hunters won't be able to completely wipe out the population, but keeping the population in check is the goal. They accomplish this with varying levels of success through the use of dogs, high-tech night vision, and helicopters. But here's where it starts to get into a grey area. Maintaining a staff, running hounds, buying night vision, and flying a chopper all cost money. Some farmers are willing to pay a bit to the depredation teams, but others are unwilling or unable to foot the costs of this service. Enter, the paying customer. For many sport hunters, an outing with a depredation team offers something they don't get in an average outing. There's generally a high level of success, and the opportunity to use the professionals' methods is alluring. It presents a sort of no-holds-barred environment. The hunter can shoot without limits on size or number, and he can utilize tools like high-end thermal imaging scopes, or shoot from the door of a flying helicopter. For the depredation company, the sport hunters are a source of additional income to help pay the expenses of the operation. For the more successful companies, "guiding" hunters may even provide a profit. Well-managed with a solid clientele, the arrangement can even become pretty lucrative... as long as the hogs hold out. It raises a couple of valid ethical questions. First of all, some people question the ethics of sport hunters participating in an activity simply for the thrill of killing more animals, especially when they're using means that would typically not suit accepted, sport hunting practices. Shooting from the helicopters, for example, pretty much eliminates any pretense of Fair Chase. Likewise, hunting at night with thermal-imaging scopes and semi-automatic rifles stuffed with high-capacity magazines wouldn't seem like much of a challenge. There's also the reality that neither method is known for quick, clean kills... nor is there much opportunity (or effort) for tracking and finishing wounded animals. Firing rapidly at a scattering herd and trying to knock down as many animals as possible before they clear the field is guaranteed to result in a significant amount of wounding. Of course, logically, most of us recognize that this is eradication. One must necessarily adopt the mindset of the exterminator, and treat the target animals as nothing more than cockroaches or mice. To the pest control expert, killing is killing, whether death occurs rapidly or slowly. The end game is to remove as many pests as possible from the customer's property. He doesn't necessarily think of the creatures as sentient beings, and he seldom takes the time to take a close look at the outcomes of his actions. So is it wrong to sell this experience to customers who are paying for the excitement... for the thrill of killing indiscriminately? Is it wrong for the customers to find the experience thrilling in the first place? What kind of person would pay for the opportunity to do this? How can someone actually do this and find it fun? It is, at the very least, a challenge to the narrative presented by most hunting apologists who would create the myth of the thoughtful hunter... of the connected sportsman who feels deeply about the animals he pursues and the sanctity of the chase. It blurs the image of the ethical paragon (if such a person ever existed in the first place), overlaying it with the grinning, bloodthirsty killer of Cleveland Amory's nightmare. Which is real? How do we reconcile? Is it necessary to try? It is a very interesting post, and something I have thought a lot about lately (and I've heard a lot of other hunters discussing this). I am an advocate of using hunters & anglers to control invasive species, and to encourage eating of non-native species. That said, I wonder if the image of hunters whooping it up as they mow down herds of pigs in helicopters does more harm (to hunting) than good. Most of us do not hunt just to kill. Many of us say this frequently. But activities like shooting from helicopters and using night-vision make us appear like liars. Some people just want to kill as much as they can as easily as possible. We can couch this in whatever philosophical language we want, but non-hunters (and I'm not just talking anti-hunters) will see activities like that and think we're bloodthirsty idiots. The negative PR is considerable. Also, I see a potential for this to lead to more questionable developments. Already regular hunters can use helicopters to gun down coyotes, under questionable predator control schemes. What if it's proposed to allow helicopters for whitetail hunting? After all, deer herds in many areas have overpopulated. I understand the problem of invasive species and of overpopulated species. I know we may need to rethink notions of fair chase. But I believe respect for quarry and our hunting traditions is still important. I don't have the answers. But I hope we have more serious thinking--like your post--and not just easy hyperbole. Finally, I'd recommend Mark J. Hainds' excellent Year of the Pig for a view of pig hunting by a forest conservationist. It does raise a lot of questions, and even more as I see the TV shows really pushing the envelope, now hunting from helicopters with muzzleloaders and archery equipment. That's not depredation work. That's thrill-seeking and/or pandering to the audience. Unfortunately, I think the primary spokesmen for the hunting community, major outdoor media, don't have any ready answers. I'm not sure I do. I have no issues with depredation shooting, either of hogs or whitetails. I have seen the damage overpopulated animals can do. I have also participated in depredation efforts myself. It is a necessary thing. And while I have no issue with predator hunting in general, I'm not sold on the value of mass predator hunts as management tools. Using coyote depredation as an excuse for "anything goes" methods doesn't hold much water to me, except in very specific cases where there is documented livestock predation or where the animals are having a true, negative impact on the ecosystem. But it does challenge the image that many hunters would like to present because the truth is that there are a lot of hunters out there who enjoy these methods... and more who would do it if they could afford it (helicopter "hunts" run about $600/hr). Good post, Phillip. If it were any other animal, I'd be more concerned about the non-hunting public's reaction, but while I am quite fond of pigs, most people aren't. No one batted an eyelash in California when we banned hunting bears and bobcats with hounds, but allowed people to continue hunting pigs with hounds. I find extermination hunts distasteful, but that's a personal aesthetic, not a value I would seek to impose on others. I do, however, think it's a real problem when we allow methods that are highly likely to result in wounding. Not cool. Extermination is never a pretty thing. It's never clean. It's seldom really humane (and is less humane the lower down the ladder it goes). Methods are often harsh and apparently cruel. Have you seen how some insect poisons work? It's awful, if you let yourself think about it. But few of us do, because hey, they're just bugs. This necessarily has to be the mindset of the wildlife eradicator as well. The fact that the pests are large, furry, and somewhat intelligent doesn't change the fact that the eradicator's job is to kill as many as possible as efficiently as possible. Wounding, especially mortal wounding, is an acceptable risk. They're just xxxxxx (insert name of pest species here). The fact that so many sportsman, folks who may otherwise be perfectly ethical and conscientious hunters, are attracted to this kind of thing creates what I see as an interesting paradox. What is it that enables some folks to essentially flip a sort of ethical switch? How does that jibe with the ongoing mythology of sporting ethics? Helicopter "hunting" is definitely a touchy subject in the outdoor community. 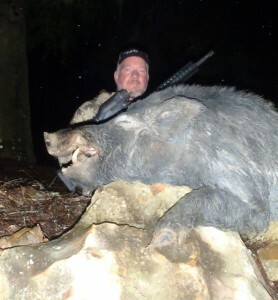 These pigs are causing a ton of damage and populations need to be kept in check. I think my biggest problem with it is when people call it hunting. It's not hunting, it's eradication. There is a big difference. It definitely casts a negative shadow on hunting in general when people see the videos. As far as calling it "hunting", that's an interesting and often heated discussion... and one to which I'm no stranger. My personal opinion on this is that, when it all comes down to it, it really doesn't matter what you call it. Call it "Ralph" if it makes you feel better, but the bottom line is the result... dead animals. That result is the issue for most anti-hunters, and for the negative opinions of non-hunters as well. Even if we all, in the hunting community, executed a semantic shift, the folks opposed to what we do would still be opposed to what we do. What's more, they will continue to link any activity in which animals are pursued and shot dead to us. Eradication. High fence and preserve shooting. Poaching. Some idiot suburban kid shooting 'possums or golf course geese with a crossbow. To the non-hunters, these are all the actions of "hunters". It doesn't matter what you or I choose to call it. Of course, there are plenty of folks right here on this blog who strongly disagree with me. But that's what keeps life lively. Even the most sophisticated scope out there will need new batteries time and again. This is because as the frequency of usage increases, energy is sapped out of batteries. Eventually, after prolonged usage, there will be need for a replacement. The good news is: finding a replacement is easier because thermal scopes use batteries that are easily available in retail outlets around the world. Resolution of modern day scopes is incredible. This is because of the use of special lens. In some cases, 5X magnification is the scenario. thermal hunting scope has a great exterior and is a highly functional device. Compare and contrast options before making a purchase.